So many compliments and three marriage proposals, it’s almost enough to turn a girl’s head. 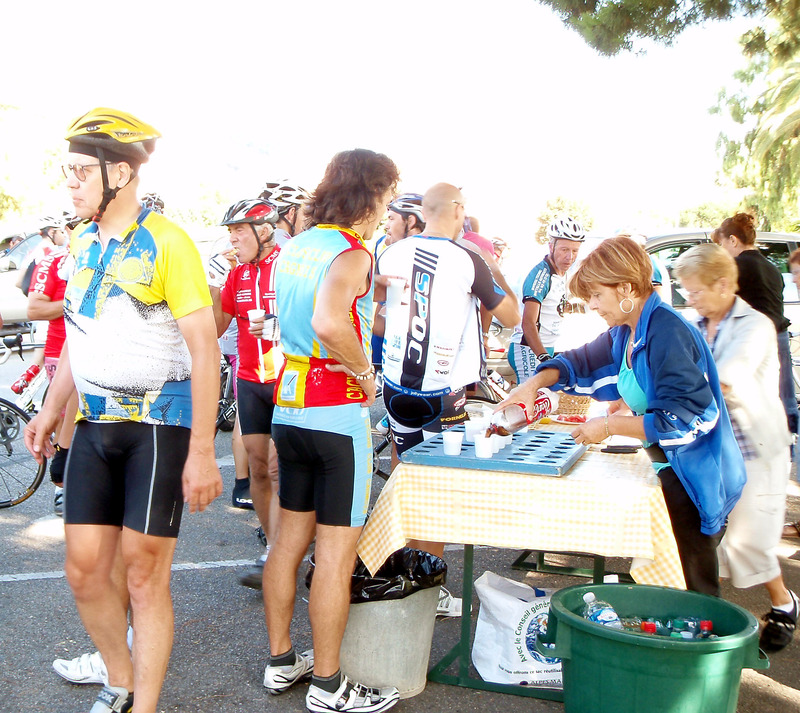 Yesterday it felt as if we were feeding the five thousand, although it was only around 600 cyclists and volunteers. My (in)famous pain d’epice garnered much praise, including some from a maitre patissier. I am however still very reluctant to divulge my recipe. As you know, my aim was not to run short of food and, me and my crack all-female team of volunteers, we just about squeaked it. We were down to our last couple of packets of biscuits when the feed station was closed at around noon. This was immediately followed by a generous apero for the presentation of the prizes for the Ronde where I happily reprised my favourite role as the world’s oldest podium girl. I got to kiss a lot of fit, young, Italians, not bad work for a Sunday morning. Afterwards, I packed everything up, drove home and promptly fell asleep on the sofa. Feeling refreshed by my longish cap nap, I compiled the results of the Ronde and the pointage for onward transmission to our cycling federation. I then managed to catch the last few kilometers, of the last stage, of the Tour of Burgos. Both the stage and the overall was won by one of my favourite Spaniards, Samu Sanchez. With my beloved having departed for the States yesterday morning, I have a few days of peace and quiet to restore order to the flat, catch up on my chores and sort out the guest room ready for the arrival of my Swiss cycling friends. They’re staying overnight and then we’re all travelling down to the Luberon for a concerted attacked on Mont Ventoux this week end.